1. You can use your tax refund at Del Toro Auto Sales to make a down payment. Many people know that when you have a loan, your monthly payment is predicated on the actual amount that is financed. If you are looking for a low monthly payment on your quality used car in Auburn we suggest to use your tax refund as your down payment. This will allow the financed amount to be lower, making your monthly payment lower. In addition, you will still be able to finance the used car loan for the normal term say 72 months. For example, if you find a vehicle you desire that is $8,000 and you are able to make a $3000 down payment because of your tax refund, you will only be financing and making monthly payments on $5,000. This puts you in a good position to have a small monthly loan payment for 72 months or a short term loan and pay off your used car much faster. 2. Here at Del Toro Auto Sales we know it’s tax season and many people like to use their tax refund on a quality used car, especially at a dealership where inventory is extensive with a variety of cars that range in year, makes and models. We know our customers like to save money and we want to ensure we have happy customers leaving our lot because they know they just received a quality used car at a great low price. 3. Financing a used car is a smart long term investment especially while using your tax refund. You want to take your time shopping for the right car for you with the intentions in mind for what this vehicle will be used for. Visit Del Toro Auto Sales website and search our used car inventory. Compare makes and models, look at CarFax history and even use our payment calculator to determine your monthly payment after making your tax refund down payment. Once you have found your desired used car, take a few minutes to fill out our pre-qualified application and within minutes you will receive a reply. 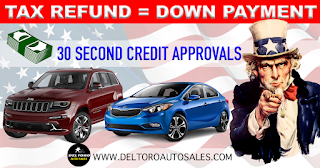 Financing a used car at Del Toro Auto Sales is a smart investment because it means you will be getting significant value everyday for your vehicle and with terms that is comfortable for you. For most people, a car is a necessity, so make smart choices and take your time. Visit one of our team specialists seven days a week at Del Toro Auto Sales during our extensive business hours and view our large inventory of quality used cars. Take a car for a test drive, ask us questions, fill out our application and drive off with your new used car today.